I haven’t been blogging as much because I went through a period of illness mixed with a busy school schedule, but I’m excited to be back online. 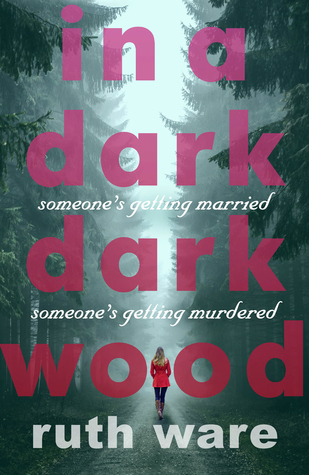 While I was recovering, I read a really fantastic book: In a Dark, Dark Wood by Ruth Ware. This was a really exciting read, and I felt like I just didn’t want to put this one down. I needed to know what was going to happen next. This book is largely divided into two parts: for the first half, you’re trying to figure out who was murdered and for the second half, you’re trying to figure out who committed the murder. This one is filled with twists and turns and unreliable characters. I had a few problems with the main character of Nora, but unfortunately I don’t think I can write about most of them without giving too much away. Overall, she did feel a little too contrived. She seems as if she was written to be too deliberately unreliable, and I think that this did take away from the story just a bit too much. Still, while I wasn’t thrilled by the lack of character depth, I was entranced by the plot and I would recommend this to anyone looking for a plot-driven mystery.